Pros: A short, sweet and very amusing performance with some cracking acting in the beautifully cool Finborough auditorium. Cons: Energy levels dropped in certain places where the dialogue got slightly long-winded and frustrating. Our Verdict: A great show which successfully addresses a serious issue in a comical manner. Well worth seeing! Human beings really are a bizarre species. That was the overarching thought that was ringing in my ears as I left the wonderfully cool auditorium of the Finborough at the end of An Incident at the Border, and walked back out into the first summery evening we’ve had this year (naturally it’s too hot for me now; bring back the rain!). The second thing to cross my mind was the feeling of being reminded about just how high the standards are at the Finborough. This was my first trip back there since we interviewed their Artistic Director Neil McPherson a couple of months ago, and my first show there since March, and it was long overdue. 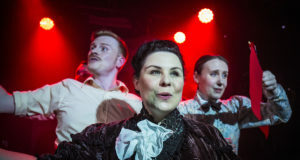 Every independent venue we visit is a treat, but there is something particularly special about the Finborough, possibly because it consistently delivers the slickest and most professional fringe (or ‘off off West End’) productions that you can find in London. 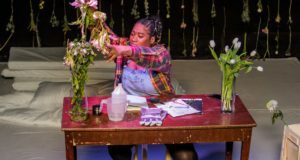 An Incident at the Border is a single-act play which takes a comic look at the nature of borders or, as the synopsis says, at the ‘imaginary lines which divide us’. It’s a unique and very clever satirical piece which ridicules the nature of these bizarre political boundaries that we take for granted in the modern world. Beyond borders, it also takes a few comic jabs at the wider ideas of national and individual identity; there are laughs at the expense of conscription for example, as well as at the three very different characters that we meet. In short, it’s a very intelligent and witty piece of writing which succeeds in making the audience laugh and think about how ridiculous it all is. If you need any further convincing, then it runs for just 80 minutes, making it a short, sweet and very punchy show. The script is brought to life brilliantly by three very different but equally good performances. Tom Bennett, playing the care-free Arthur, was a particular favourite of mine, his performance being incredibly realistic and throwing up character traits that were instantly recognisable and deeply amusing. In the highly charged political setting of the play, his desire to be carried along by the current and to avoid confrontation (in all areas of his life!) provided the basis for much of the laughter in the show, as well as a much-needed antidote to the other more intense characters. Marc Pickering, playing the jobsworth Reiver, the border guard, was also extremely amusing, again delivering a character which was instantly familiar; hopeless, insecure, and desperate to cling on to and exercise the small amount of power afforded to him by ‘the system’. Finally Florence Hall plays the uptight (or politically ‘involved’) Olivia, the louder, pushier and altogether more intense girlfriend of Arthur, with great skill. She probably has the hardest role of the three, with her character being that entirely necessary but rather frustrating bossy-boots, but Hall was excellent; independent at times, vulnerable at others, it was another very good performance. There is very little wrong with this production, but it wasn’t quite perfect. It started to lose energy where the dialogue loitered on a particular topic for just a couple of minutes too long in certain places, but other than that it was a wonderful performance of a delightfully witty play. Most importantly, it left me with that feeling of care-free happiness as I thought about why the hell any of these bizarre political games matter. What the hell is a border after all but an imaginary political line used to separate groups of people?! Even for a second it was a great feeling to have. Moments later however, I walked past Earl’s Court, the soon-to-be Olympic volleyball venue, and reality snapped back into place as I noticed several members of the Armed Forces standing guard outside a large black and yellow barrier. Oh well, on we trundle! An Incident at the Border runs at the Finborough Theatre until 7th August 2012.